Within the word spagyria, can be found two Greek words that are cleverly hidden. Spao, meaning to draw out, to divide, and agerio, to gather, to bind or join. 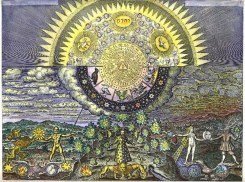 It is within these two words is that which is found to be the fundamental basis and the unwavering foundation of every type of alchemical work – be it in the physical or the subtle realms. The three stages of alchemy are always present. Separation, purification and cohabation or recombination. This is the heart of the Great Work, the Magnum Opus which is the Alchemical Art. It is also a part of the Poisoner’s Craft, the central core of the healer, should he or she know anything of what they are doing. It was Paracelsus the Great who imparted to the masses the very idea that one might study, or try to understand the nature of things all one wishes, they cannot know the true nature of anything unless by being with them. Nature, in all Seven Realms of Existence, is conscious, living and on a level of power that few take the time to interact with, let alone fully understand. This Power will interact directly with those who desire it if the intent of both heart and soul are one of openness. Within this, the ability to identify something in the most intimate sense, it allows both the seeker and the sought to be all that they can be. When I was very young, I knew precious little about the Art. It was not until I had met a particular scholar from the land of Persia, Khalid Ibn Yazid. It was through him that I truly came to understand the depth of the Art that encompassed all that was a part of what was both a part of the realms of the Human and the Fae. He was, like the Fae, in essence himself an Immortal. I would find out much later that he was not from Persia at all but born many centuries before in Egypt when the Pharaohs still ruled that land. Khalid was in his youth the third most powerful man in Egypt, a priest and nobleman in his own right. One of the most precious tomes that I own is a book that he had penned by his own hand, “The Paradise of Knowledge”, for it was knowledge that he was most dedicated to. His guidance was gentle and he would let me make my own mistakes. Looking back, perhaps that sort of guidance was not at all gentle, but rather justifiably stern in that I blew up many elixirs, formulae and potions in the process of my learning. But it was exactly what I needed. Now, it seems, more than before, the three processes of alchemy, the separation, the purification and recombination. are making manifest in my own life. The Prima Materia, or first matter, the goal, the greatest riddle, the alpha and the omega of the Magnum Opus is at hand. You do not need any potion to become intimately aware of that.